Entering his third season, the 22-year-old is established in Freo’s best line-up and is now keen to add attacking dash to his game. “I had the exit interview (with Lyon) and what he wanted me to work on was a bit more run off half-back, which I’ve never really done over my career,” Ryan told 6PR. “More run and with the kick-ins, do a little bit more stuff we want to do and probably take the game on a bit more, which I’ll have to learn how to do. “I’ve got Nathan Wilson next to me and Stephen Hill, so they will be pretty handy blokes to learn how to take the game on from. 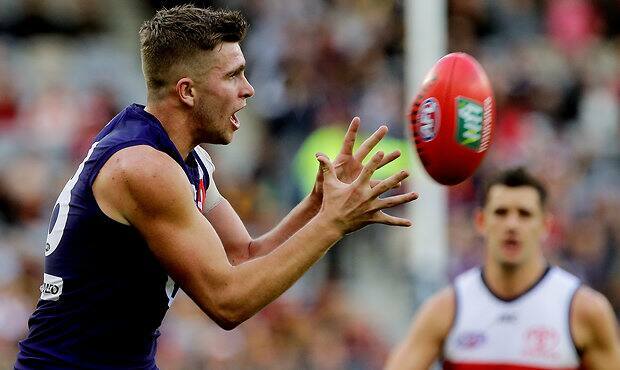 There should be genuine competition amongst the Dockers’ tall forwards next year, with Matt Taberner, Cam McCarthy and Brennan Cox fighting for spots and youngster Hugh Dixon looking a likely prospect ahead of his second season. “It’s going to be good when we come out of D50 and we see three to four talls down there,” Ryan said. The Dockers’ first-to-fourth year players returned to pre-season training on Monday with clear intent on gelling as a unit. Freo has added four recruits so far this off-season – including Reece Conca from Richmond and ex-Bombers speedster Travis Colyer – and is set to take another four players at the NAB AFL Draft later this month, not including the rookie draft. The new-look squad will then travel to the Gold Coast for a week in early December to hone in on Lyon’s game-plan. “Learning to play with each other is going to be a big part of pre-season. There’s going to be a lot of work to do, but looking forward to it,” Ryan said.